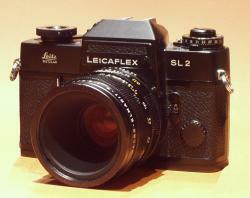 The Leicaflex SL2 remains, almost 30 years after its introduction, one of the best manual SLR ever made. Third and last of the Leicaflex series before the first Leica R, the Leicaflex SL2 improves the previous models. It was made from 1974 to 1976. It keeps the very good viewing screen of the SL and adds a split-image rangefinder in the center of the microprism area. The CdS light meter is more sensitive in low light and a backlight is added for the exposure indication needle. In addition to exposure indication, the viewfinder shows the actual aperture and shutter speed. TTL light measurment is made in semi-spot mode only on the central zone of the finder covering about 10% of its surface. The fully mechanical shutter gives speeds from 1/2000 s to 1s plus B pose with 1/100 s flash sync. The SL2 can be used with 2 or 3 cams Leica R lenses. A motorized version, the Leicaflex SL2 Mot, could be fitted out with a motor as big as the camera. The Leicaflex SL2 is a true engineering and reliability marvel. For many people it remains, almost 30 years after its introduction, the best manual SLR ever made.